A stitch in time, is a film made in 1963 starred the English comedian Norman Wisdom, who was then at the height of his popularity. He played his trademark 'Downtrodden Proletariat' character and, for most of the film, Norman causes havoc at his local hospital. 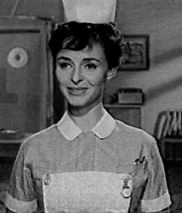 He runs about, befriends an orphan, falls over, is mistaken for a Doctor and a patient, runs about a bit more, falls over again, upsets the visiting dignitaries, shouts "Mr Grimsdale" a lot and dresses up as a nurse. It's weird, all this early '60s cross-dressing - it featured in the Carry Ons as well. Who was it that said The Past is a Different Country? 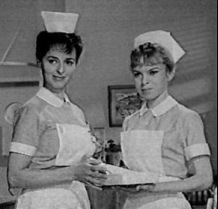 Anyway, being set mainly in a hospital, there were plenty of Nurses on hand, coping magnificently despite the chaos going on all around them..
Nurse played by Pat Coombs in 'A stitch in time', UK 1963. 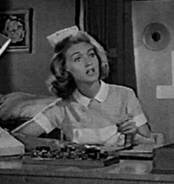 Nurse played by Wanda Ventham in 'A stitch in time', UK 1963. 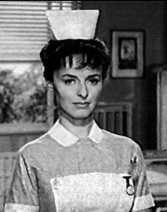 Nurse Haskell played by Jeanette Sterke in 'A stitch in time', UK 1963. 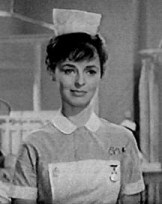 Nurse Rudkin played by Penny Morell in 'A stitch in time', UK 1963. 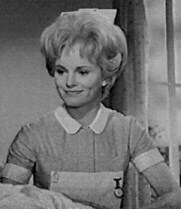 Nurse played Jill Carson as Nurse in 'A stitch in time', UK 1963.